Marilyn Mosby, Baltimore City State’s Attorney, recently picked up the endorsements of prominent lawyers and faith leaders in her campaign to be re-elected. Mosby, her surrogates and an opponent in the race, Thiru Vignarajah, are also hitting back at claims that Ivan Bates was an effective prosecutor when he worked in the Baltimore City State’s Attorney office. Mosby, Vignarajah and Larry S. Gibson, a veteran attorney and University of Maryland law professor, argue Bates’ claim of `never losing a murder case is’ is dubious at best. “Friends of Marilyn Mosby” issued a statement on Bates’ record June 11. “The truth is that Mr. Bates has never won a conviction in a murder trial and has limited prosecutorial trial experience. His claims of being `undefeated’ are an outright lie,” the statement read. 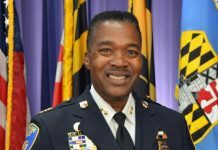 Vignarajah, a former deputy attorney general for Maryland echoed Gibson and Mosby’s findings saying his record of zero murder prosecutions as a lead attorney proves “Bates failure as a prosecutor,” according to a report in the Baltimore Sun. In that same Sun story Bates seems to argue Mosby and Vignarajah are teaming up to defeat him on June 26. 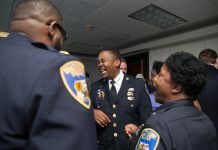 “It shows what we all thought is that they’re in this together and this is a concerted effort,” Bates said. 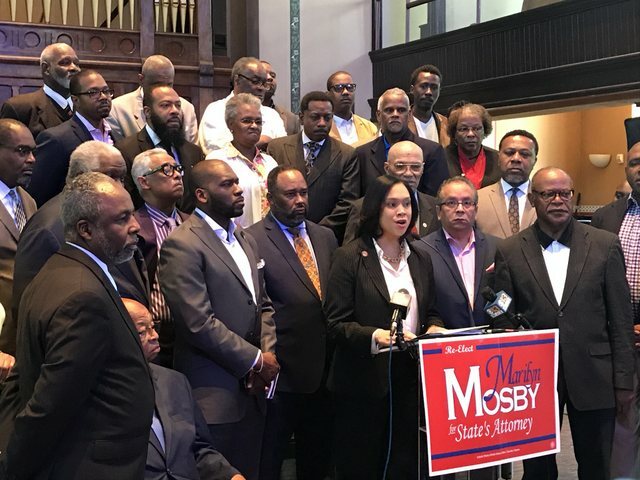 Many of the most powerful faith leaders in the Baltimore metropolitan area came forward to support Mosby on June 12, at the historic Orchard Street Baptist Church (home of the Baltimore Urban League), in West Baltimore. Mosby received the endorsement of 65 clergy and faith leaders in her re-election bid. “This is a critical moment in our city’s history and we cannot afford to take a step backwards as it relates to the pursuit of justice,” said AME Bishop Frank M. Reid. 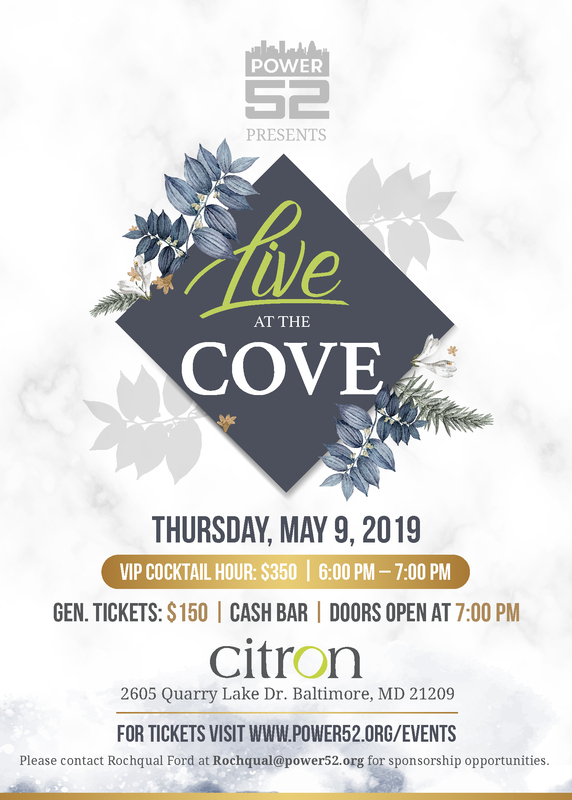 “Marilyn is the independent leader that we trust will always do the right thing for the people…Baltimore, wake up and support Marilyn Mosby,” Reid added. In addition to Bishop Reid, Pastor Karen Bethea of Set the Captives Free Outreach Center, in Baltimore County, Dr. Donte L. Hickman of Southern Baptist Church, in East Baltimore, Rev. Dr. ACD Vaughn, of Sharon Baptist Church, in West Baltimore and Pastor Jamal Bryant, of Empowerment Temple, in Northwest Baltimore, were among the faith leaders who rallied around Mosby and her re-election campaign. “Marilyn will win because Marilyn has a team,” said Bryant. “We fully intend to ensure that our congregants are fully informed about the choices they have in this election. For me, the choice is clear, Marilyn Mosby is the best choice for State’s Attorney.” Bryant added the faith community’s support is not limited to Christian worshippers. “Please know that this does not just represent Christian churches, but mosques and synagogues and faith temples and those who are holistic in their approach,” he said. The AFRO has learned two accomplished veteran defense attorneys are also throwing their support behind Mosby; Billy Murphy, the attorney for the family of Freddie Gray, who also endorsed Mosby when she initially ran for State’s Attorney in 2014, and Warren Brown, one of the attorneys representing Dawnta Harris, the 16-year old charged as an adult with first degree murder in the killing of Baltimore County Police Officer Amy Caprio.